Sometimes one big lovely present is better than a few small ones. If you’re looking around for something to buy your loved one this Christmas and you’re drawing a blank, take a look at our luxe favourites. From the limited edition to the perennially popular, you can’t go far wrong with these treats! If you’re looking for a gift that will really impress that special sophisticated someone, try the luminous floral scent of Calvin Klein Beauty. The fragrance is based around the scent of the neo-lily, a clean-smelling yet sumptuous floral note that is the essence of femininity. With the spicy warmth of Ambrette Seeds, heady Jasmine and a resonating base of Cedarwood. The set includes the 30ml Eau de Parfum and the matching 100ml Shower Gel. The Mason Pearson brushes are a haircare staple that last a lifetime. Because they are predominantly handmade, they might be priced a little too far out of a daily budget – making them a perfect luxury gift. With both bristles and nylon, the BN3 brush is suitable for most hairtypes, from normal to thick. The bristles massage the scalp whilst detangling the hair, distributing essential sebum from the roots through to the ends. Getting a little bit of luxe make-up is just lovely at Christmas, especially when it’s from the ultra-sumptuous Guerlain. Rich colours are only the starting point; it’s the packaging that will catapult this eyeshadow compact to the top of Christmas Lists. Two sets of contrasting duos make up each compact, with silky soft textures and intense pigment, you’ll never reach for another eye colour. The complete He-Shi tanning ritual in one gorgeous, boxed set. First scrub away dead skin cells with the fruity Exfoliating Bodywash, then smooth on the innovative quick-dry Express Liquid Tan with the included Tanning Mitt, before hydrating the skin with the smooth Souffle Moisturiser. A perfect set for a woman who loves to glow naturally. A luxurious way to create a flawless complexion. The multicoloured pearls of powder illuminate the face, with mauve to brighten, green to eradicate redness, and pink to infuse a healthy glow. Aside from its practical usage, the Meteorites Pearls packaging makes it a seriously beautiful gift. A lovely, delicate scent containing cherry extract from the Provence for beautiful bathing. The decadent Bath & Shower Gel nourishes skin and gently cleanses, while the shea butter-enriched lotion hydrates and leaves an iridescent, shimmering veil on the skin. A matching travel size hand cream completes the set, moisturising hands with its lively scent. A perfect accessory for any fragrance lover, this year’s limited edition Lola Solid Perfume is a playful addition to the bestselling Lola line. With its chunky golden bracelet and oversized fuchsia charm hiding away the fragrant surprise, gifting someone with this perennial sell-out will score you some serious brownie points! 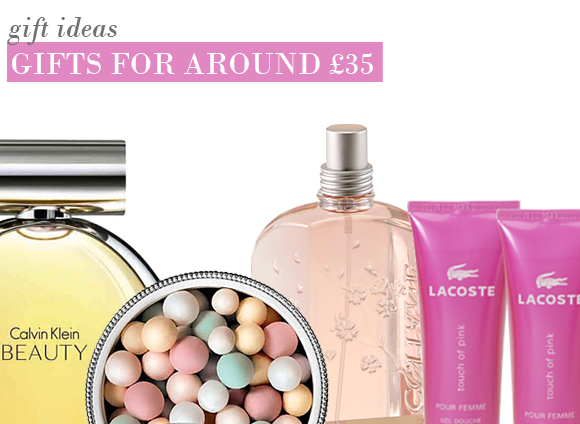 Fresh, floral and very, very pink, Lacoste Touch of Pink is a bestseller year after year. A burst of vibrant Blood Orange mingles with the softness of Jasmine, before drying down to a gorgeous vanilla-woody base for a young, modern and completely feminine scent. The set contains the 50ml Eau de Toilette, and the matching Shower Gel and Body Lotion for continuous scenting. A limited edition set for all-out girly Christmas glamour. The set contains all you need to replicate the Bare Escentuals Pink Ribbon Christmas look, with two eye colours, a blush, a mineral veil, lipgloss, eyeliner, mascara and two limited edition pink brushes. With ribbon embellished packaging and new colour ways, this is a Bare Escentuals fan essential! AFter using Guerlain Meteorites for the last ten years, nothing would persuade me to change to a new product - it simply wouldn't offer the same luxurious, beautiful and value for money that this product does. I love to hear the sound of those little balls of pearly pastel colour rolling around in the container as I mix them with my brush, before it glides onto my face, giving a luminous finish. The other thing I adore is the perfume of Parma Violets which I've never found in any other product - it's a classic scent which I'll never tire of. Price-wise, Escentual offered the cheapest I could find, I'll definitely be using this online shop again - in fact I already have! This entry was posted on Thursday, November 18th, 2010 at 9:30 am and is filed under Christmas, Gifts, Hints & Tips. You can follow any responses to this entry through the RSS 2.0 feed. You can skip to the end and leave a response. Pinging is currently not allowed.